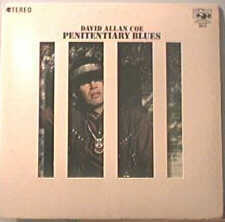 Penitentiary Blues is the debut album of American singer David Allan Coe. It was released in 1970 on SSS International Records. The lyrics of Penitentiary Blues are often dark and foreshadow the content of David Allan Coe’s later country albums, discussing themes such as working for the first time, blood tests from veins used to inject heroin, prison time, hoodoo imagery and death. David Allan Coe’s debut album, released in 1969 shortly after his release from prison, is in its way a wonder. 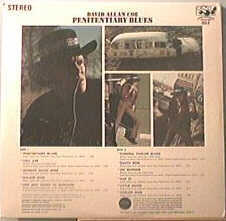 Penitentiary Blues is far more a blues album than it is a country record, musically styled after the dark, loungy blues of Charlie Rich and Jerry Lee Lewis in his Mercury period as well as the rawer mercurial blues of Bo Diddley, Lightnin’ Hopkins, and Tony Joe White. The subject matter is far darker and foreshadows the subjects and themes of Coe’s later country records. The title cut mentions everything from working for the first time to taking blood tests in his heroin veins. “Cell 33” is a wide-open rocking shuffle with Jerry Lee Lewis piano coming out of the backdrop of a muddy mix and playing solo after choogling guitar riff over lines like: “They’ll find me hangin’ here tomorrow/If they don’t come with the key.” Musically, Coe was wrapped in the blues, particularly the barroom tradition. At the time, his band was clearly not capable of handling the more sophisticated honky tonk songs he would be writing shortly thereafter, some appearing on his next recording, Requiem for a Harlequin. This is redneck music, pure and simple, fresh out of hell and trying to communicate the giddiness of reprieve as well as its horrors to the listener. There’s an obsession with hoodoo imagery and death, with self-loathing and boasting, and the contradictions in a man who doesn’t want to go back to prison but who seems resigned to the fact he will because he’s been inside so long (for Coe it was almost 20 years), he has no idea how to live on the outside. There are hints and traces of the lyrical genius Coe would display later, but taken as a whole, Penitentiary is thoroughly enjoyable as a rowdy, funky, and crude blues record full of out-of-tune guitars, slippery performances, and an attitude of “f*%$ it, let’s get it done and get it out,” which was a trademark of Plantation Records during the era. Penitentiary Blues is a set of voodoo blues from a future country legend and pariah. When I first heard this Album I was amazed. I’ve always loved coe but had only heard the stuff that was easily available. I found PB on YouTube and all I can say is that was a great day. Nothing excites me more than discovering great music. Especially when you discover music from a legend and one of your heroes. Love this Album! I’m still looking for a reasonabl copy of requim for a harlequin. Need it!